Ex-child bride says, "I didn't want to sleep with him, but he forced me to"
Editor's note: CNN does not usually identify children of alleged abuse, but in this case the girl and her family gave CNN permission to tell her story and use her name. Nujood Ali, 10, has been chastised by some in Yemen for speaking out about her arranged marriage. 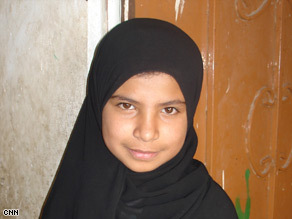 SANAA, Yemen (CNN) -- Nujood Ali is 10 years old, but she already has been married and divorced. It was an arranged marriage in which she said a husband three times her age routinely beat and raped her. "When I got married, I was afraid. I didn't want to leave home. I wanted to stay with my brothers and sisters and my mom and dad," she said, speaking to CNN with the permission of her parents. "I didn't want to sleep with him, but he forced me to. He hit me, insulted me." Nujood's parents married her off in February to a man in his 30s whom she describes as old and ugly. Her parents said they thought they were putting her in the care of her husband's family, but Nujood said he would often beat her into submission. Nujood then turned to her family for mercy. "When I heard, my heart burned for her; he wasn't supposed to sleep with her," said Nujood's mother, who asked not to be identified. But, initially, she also told her daughter she could not help her -- that she belonged to her husband now. Nujood's father, Ali Mohammed Ahdal, said he is angry about what happened to his daughter. "He was a criminal, a criminal. He did hateful things to her," he said. "He didn't keep his promise to me that he wouldn't go near her until she was 20." When contacted by CNN, the girl's former husband declined to comment. Nujood's parents, like so many others in Yemen, struck a social bargain when they decided to have their daughter wed. More than half of all Yemeni girls are married off before the age of 18, according to Oxfam International, a nonprofit group that fights global poverty and injustice. Many times girls are forced to marry older men, including some who already have at least one wife, Oxfam said. According to tribal customs, the girls are no longer viewed as a financial or moral burden to their parents. "There is always a fear that the girl will do something to dishonor the family: She will run away with a guy, she will have relations with a boy. So this is always the phobia that the families have," said Suha Bashren of Oxfam International. Bashren calls the tradition of child brides in Yemen a national crisis. She works with young girls to protect them from early marriage, abuse and one of the highest maternal mortality rates in the world. The Yemeni government is holding legal and religious workshops to try to deal with the issue of early marriage. But experts say marrying off a young daughter is generally still seen as the right thing to do. "A lot of people in the public don't think that this is wrong or that what happened to her was abuse," Bashren said. In Yemen, there is nothing new or extraordinary about Nujood's story because children have been married off for generations. The country's legal minimum age for marriage was 15 till a decade ago, when the law was changed to allow for children even younger to be wed. But what is most unusual is that this young girl took such an intensely private dispute and went public with it. Nujood said she made up her mind to escape from her husband, describing how on a visit to her parents' home she broke free and traveled to the central courthouse across town and demanded to speak to a judge. "He asked me, 'What do you want?' And I said, 'I want a divorce.' And he said, 'You're married?' And I said, 'Yes,'" she recalled. What unfolded in those few days in April gripped the country on the southern tip of the Arabian Peninsula. Nujood got her divorce, but based on the principles of Islamic Sharia law, her husband was compensated, not prosecuted. Nujood was ordered to pay him more than $200. The human rights lawyer who represented her donated the money. But for this determined spirit, it was still a sweet victory. "I did this so that people would listen and think about not marrying their daughters off as young as I was," she said with a shy smile. Now back at the family home, she said she won't go outside to play -- that all the attention bothers her. Some still condemn the young girl for speaking out, believing that she shouldn't have challenged convention. Human rights advocates said it will take more than a generation if this practice is to change in Yemen for other children. "These girls are living in a misery that no one is talking about," Oxfam's Bashren said.